The extensive literary journey, which Sitara-e-Imtiaz Dr. Ejaz Rahim has taken from unfamiliar sphere to widespread appreciation and achievement on international level, is definitely remarkable. As Oscar Wilde says– “To live is the rarest thing in the world.” Ejaz has been living as a soldier in the circumference of literature. 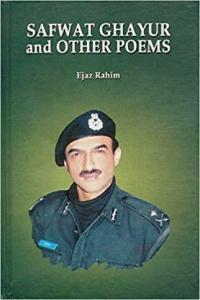 He lives and acts within a world whose deeper aspects are revealed in his magnificent work, Safwat Ghayur and Other Poems, which includes a short biographical essay on martyr Safwat Ghayur (1959-2010), a brave officer and former Chief of Pakistan's Frontier Constabulary and some interesting poems. Dr. Ejaz’s work, whether it be poetic or prosaic, is always a portrait of himself. The apparent portrait primarily represents his feelings and thoughts as portrayed in his works. It shows colours of the real and the ideal world reflected in his poetry. It is in fact the relation of his heart with the poetic words and images that symbolically present the integrative socio-cultural and spiritual reality of the present world. It also transforms the material world and places it in synchronization with the divine, opening the doors of unseen, inexperienced and unattained possibilities. This understanding to see in the underlying depths of words of writings is what shows maturity of thought, word and deed in this book. ‘The crown of literature is poetry’ stands true to the writings of Ejaz Rahim, who spectacularly depicts the essence of his poetic craft in English language expressing his innermost yearnings and creative outpourings. India’s 11th President, late Dr A.P.J Abdul Kalam once quoted–“Dream is not what you see in sleep, it is something that doesn’t let you sleep.” It is true to the poet himself. The passion to write what is seen, experienced around self is so deeply rooted in the poet’s heart that his expressions go beyond the boundary of words to the extent that he is prepared to go as far as China in search of knowledge and truth. This road is secure for a sure shot, open to all seekers who with serenity, will and wisdom see self through the transparency of the veils. Undoubtedly, then earnest seeking of truth is fruitified in form of his poems, where his heart has poured in black and white– a unique mode of well framed thoughts in words. His verses are simply assimilated and cleanly readable. To read him is not merely to get an idea of what he says, but to go off with him and travel with him to pace up with his literary companionship. Moreover, going through his life's achievements, awards and honors mark a large-scale privilege and honor, not only for the people of Pakistan, but also all the lovers of poetry nationally and internationally. Devi Nangrani, born in Karachi, Sindh in 1941, is a celebrated Sindhi, Hindi and English poet, writer and critic. Sindhi being her mother tongue, she started her write ups with Hindi Ghazal, and then to the translation of literary works from Sindhi to Hindi and vice versa. She has published 24 books, and her stories and articles have also appeared in various magazines and newspapers of national and international repute. She is a recipient of the NCPSL Award. She resides at USA- 480 W Surf Street, Elmhurst IL 60126 and can also be contacted at dnangrani@gmail.com.